HCM CITY — HCM City plans to establish three more hi-tech agriculture parks by 2020 with the aim of becoming one of the country’s leading cities in high-tech agricultural development. The first hi-tech agricultural park in the city was established in April 2010 in Củ Chi District, some 70km from the city. A new park will be built adjacent to the Củ Chi Park, while the other two will be in Cần Giờ and Bình Chánh districts. The city’s objective is to introduce new technology and help farmers build trademarks for their agricultural produce. The parks will develop new high-quality products for farmers as well as viable production models, such as a farm-to-fork supply chain. They will also serve as training schools for future workers in hi-tech agriculture. By 2020, HCM City is expected to have a total of 570ha of hi-tech agriculture parks. The city also plans to build a new biotechnology centre, the largest in the country with state-of-the-art facilities, worth thousands of billions of Vietnamese đồng. Located in District 12 and covering 20ha, the centre will conduct research and apply high technology in agriculture as well as healthcare, medicine and food. Dr Dương Hoa Xô, deputy director of the city’s Department of Agriculture and Rural Development, said the centre would play an essential role in developing high-tech urban agriculture. The city is in the process of restructuring the agricultural sector, partly because of limited land in the area. Xô said that the city would also create favourable conditions and offer incentives for people and businesses to invest in high-tech agriculture. The Củ Chi hi-tech agricultural park is now investing in safe vegetable farms in Củ Chi, Bình Chánh and Hóc Môn districts under VietGAP standards, with a total area of 145ha. 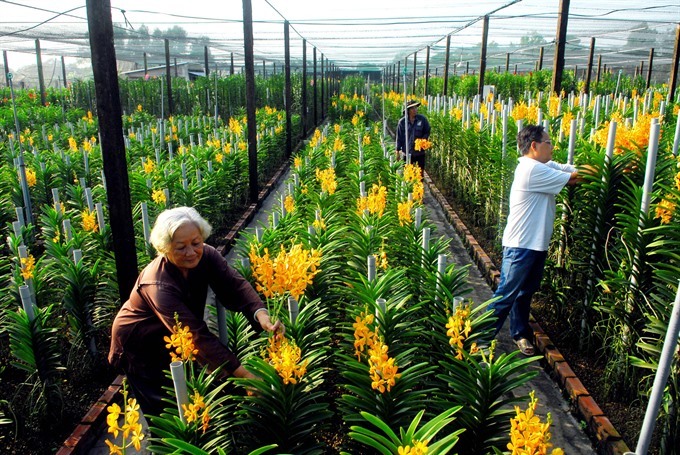 The park is using organic methods with higher yields of 15 to 30 per cent compared to traditional cultivation, including an area producing orchids in Củ Chi District. Dr Đinh Minh Hiệp, head of the management board of the HCM City High-tech Agriculture Park, said the Ministry of Agriculture and Rural Development had awarded national certification to many agricultural technologies, which will be used by farmers, farm owners and businesses.